If you didn't think you had the space or the budget to go modular, the Kraftzwerg is the answer. Analogue circuits. Semi-modular with loads of patch points. Small and light. No internal glide. No sine wave for oscillators. No manual PWM. MFB is the brainchild of Manfred Fricke, boutique analogue designer who has been running out of his Berlin HQ for many years now. This is his latest and greatest synth design, and it follows the MFB tradition of offering powerful but tiny synths for a very reasonable price. Its small footprint is significant and, as far as analogues go, this might have highest feature to size ratio of any semi-modular synth out there. To give you an idea, the case is a couple of inches smaller than a copy of FM. Inside you get a triple VCO, dual LFO, 24dB low-pass filter, VCA and dual ADHSR modules. 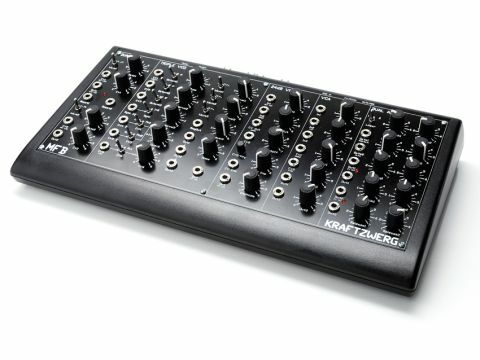 Add 34 knobs, 13 switches and 37 patch points to the surface and a MIDI-CV converter to the back and you get a synth with loads of sonic potential. One of the main reasons for the Kraftzwerg's small size is its smaller 1/8-inch mini-jacks for patch points, and smaller than average (but still perfectly formed) knobs and miniature toggle switches. "The Kraftzwerg's small footprint is significant and, as far as analogues go, this might have highest feature to size ratio of any semi-modular synth out there." On the subject of build, it does have a bit of a project feel to it, which might be to do with the off-the-shelf knobs and switches. The screen-printing is nice and clear, and overall, construction good enough for us not to complain about it (especially at this price point). The unit arrived with half a dozen patch leads which are just long enough to span the furthest patch points, a special PSU and a two page printed manual in German. We downloaded the UK version from the MFB website, and it was about as concise as any synth manual of this nature can be. The MIDI channel for the CV converter is set using dipswitches at the back of the unit, and there's also a little heat-sink which can kick out a bit of heat once it warms up. When the unit powers up, the oscillators are tuned up and stabilise automatically. It seems to hold its tuning quite well, and we didn't notice any drift in pitch. As the name suggests, in a semi-modular synth all the modules are connected internally, and it should be able to make noises without the need to do any patching. The patch points provide the opportunity to explore and experiment with the signal path and combine different modulation sources. The modules are laid out from left to right. Dual LFOs are on the left, followed by the triple VCO and the low-pass filter in the middle. Next we have the VCA and on the far right is the dual ADHSR section. To understand the normal signal flow, all you need to do is examine the patch points and their associated knobs up close. MIDI note messages are automatically converted to CV and Gate values. These are wired in to the oscillators and envelope sections so there is indeed no need to patch up anything to get a sound going. Each of the three oscillators and the noise source has its own volume level - these route into the filter and on to the VCA. Turning the gain past five opens it up and gradually lets the sound through without triggering it with a volume envelope. Envelope 1 is routed to CV cut on the filter. This is joined by a second CV input that uses a small pot to set the amount, and is normally linked to key-tracking. Both LFOs have predefined functions - LFO 1 is assigned pitch modulation duties. It can be switched between all the oscillators or just OSC 3 and, as mentioned before, LFO 2 automatically goes to the VCA section. 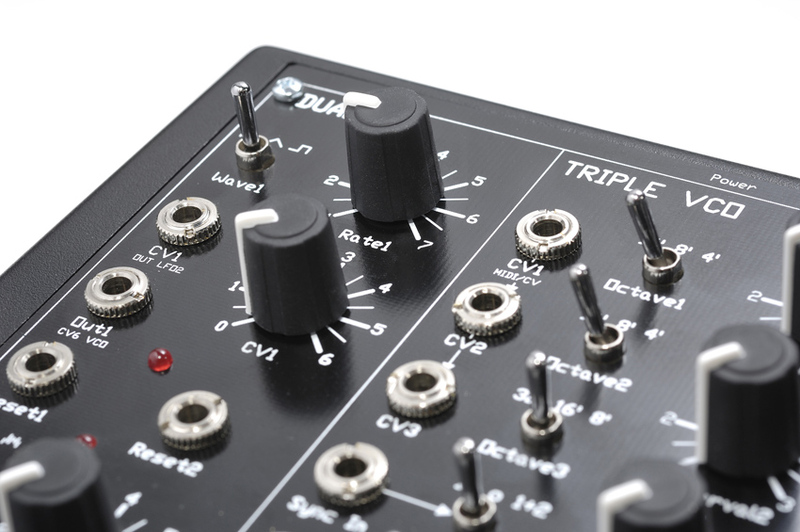 The triple VCO features three identical oscillators, each with triangle, pulse and saw waves. They all have a three-position octave switch, and the third oscillator goes an octave lower than the others. This is useful for bass duties, but also because it's the default oscillator for sync. This can be substituted with a different source via the sync input and a rocker switch selects whether either one or both of the other two oscillators get the treatment. "To understand the normal signal flow, all you need to do is examine the patch points and their associated knobs up close." The digital ring modulator is the only bit of the signal chain that isn't analogue. This has its own output, and so needs to be patched into the VCA mixer to be heard, but can be also used as a modulation source. The ADHSR envelopes are an interesting alternative to the norm, and supply an extra 'hold stage'. By default, they are exponential, but either one can be switched to a linear response. This is good enough for tight zaps and some percussive sounds, but not quite the right shape for sophisticated kick drums. It's been suggested by some that the 24dB low-pass filter has a 'Moogy' quality to it, and there is some truth in that statement. One of the classic Minimoog tricks is to plug the output of the filter back in to the external input in order to introduce a little bit of feedback. This in turn has the effect of beefing up the sound, making it thicker, and at higher settings, muffling the resonance so things can get good and grungy. When the output of the VCF is fed back in via the top input, the Kraftzwerg exhibits the same quality. In fact, it can sound much more alive cranking this right up along with the resonance maxed out to restore some of the lost high end. The filter is capable of self-oscillation, and it begins to overload when the emphasis control is more than half way. This imparts a grungy and aggressive character, which is distinctly different from the softer, Moog sound. Part of this also comes down to the way that it doesn't seem to roll off the highs as much. The lack of mellowing can sound more present or piercing, depending on the situation. However, it's a really useful and simple addition to the sound canvas nonetheless. Patching is a big part of the fun to be had with the Kraftzwerg. It's quite safe to try any combination as nothing can really be damaged when plugging in a cable. There are 37 patch points on the top panel, plus four more on the back for handling CV, Gate Pitch Bend and Mod wheel. It's definitely worth learning the internal routing first, but breaking things up with the cables can lead to some pretty crazy noises being spewed out. The LFOs in particular can be called upon for all kinds of cross-modulation up to audio rates, and can also be plugged into the mixer and used as a noise source. Pitch Bend and Mod wheel can be used live, or as part of a MIDI sequencer pattern which opens things up further, and of course, any other modular synth can get involved just by patching it in any way you wish. Without any patch cables, there's plenty of room for tweaking, and the high contrast white on black labelling makes it easy to see what's going on. Even the knobs for the dual ADSR, which are quite close together, leave enough space for tweak-happy fingers. All that can change when patch cables come into the equation. Like any other modular system, cables can get in the way a bit, especially if they have to go from one side of the unit to another (eg, patching one of the ADHSR's into the LFO CV). "The Kraftzwerg is ideal if you have a portable computer setup, a cramped studio or do a lot of live work." There are a few omissions to the line up that it would have been nice to see. First up there's no internal glide, so you will have to use a glide enable CV keyboard. Oscillators are short of a sine wave and there's no manual PWM. Sound wise, the Kraftzwerg has a bright top end, exhibiting a harder tone when cranking the resonance. There's no doubt that this synth beats a lot of the competition when it comes to size and price. Obviously, it's an enticing proposition to get such a capable modular in such a small package. The Kraftzwerg is ideal if you have a portable computer setup, a cramped studio or do a lot of live work. In fact, it's good for any occasion where analogue purity is a must, but it's just not practical to take a full-blown modular cabinet.